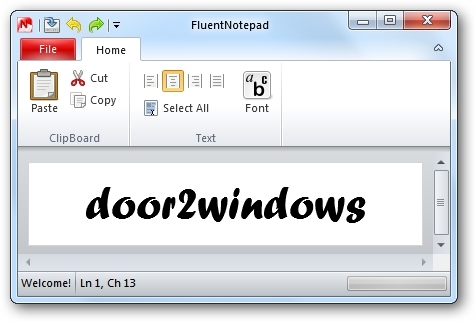 FluentNotepad is a free portable tool created by SalvoG92 at deviantART that provides a Office 2010-like ribbon user interface in Windows 7/Vista. Copy FluentNotepad.exe & Fluent.dll from the downloaded folder and paste them in C:\Windows & C:\Windows\System32 (Change C: with your system drive). Now the default Windows Notepad will be replaced with the Ribbon UI Notepad. Navigate to: C:\Windows & C:\Windows\System32 (Change C: to your system drive) and delete the Notepad.exe & Fluent.dll files in both the folders. Rename the Notepad-No-Ribbon.exe file in C:\Windows & C:\Windows\System32 (Change C: to your system drive) to Notepad.exe. Now the Ribbon UI Notepad will be replaced with the default Windows Notepad.